Spitfire List | Why Did Gerard Williams and Simon Dunstan Receive Death Threats for Writing About Hitler’s Escape? Why Did Gerard Williams and Simon Dunstan Receive Death Threats for Writing About Hitler’s Escape? Posted by Dave Emory ⋅ March 17, 2016Post a comment Email This Post Print This Post Tweet This! COMMENT: In FTR #791, we highlighted research indicating that Hitler did not die in the Bunker as believed. 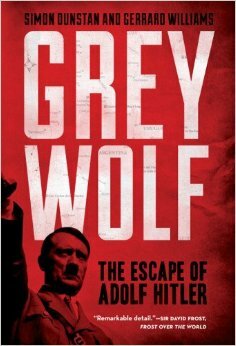 The authors of Grey Wolf: The Escape of Adolf Hitler posit that Allen Dulles and Martin Bormann reached a deal to exchange Hitler for German military expertise rendered under Project Paperclip and the sparing of the treasures of Western art. In FTR #864, we detailed Peter Levenda’s research indicating that Hitler may have ultimately found his way to Indonesia. As noted by Williams, Dunstan and Levenda, many documents about Hitler’s postwar whereabouts are still classified, more than 70 years after his alleged death. WHY? Furthermore, the authors of Grey Wolf have been receiving death threats! It is difficult to imagine that death threats would be lodged against authors of a “disreputable” or “fantastic” volume, as Williams and Dunstan’s worthy book has been called.